I’ve gone from freebie plastic leftover containers, to nice glass food storage containers with so-so lids, to nice plastic containers with air-tight lids, and — finally — to my all-time favorite glass food storage containers with air-tight lids. You could say I’ve been around the block a time or two when it comes to glass and plastic food storage containers! 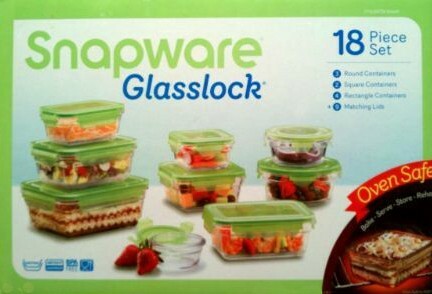 See why I like Snapware Glasslock bowls for food storage best of all. Okay, so who hasn’t started their supply of food storage bowls with empty butter containers, Cool Whip containers, and just about any other empty plastic bowl that some food came in? The ones I have the most of are those reusable plastic Glad storage bowls! I buy deli turkey like this all the time that comes in Glad containers. And some pet food comes in those containers too. As far as glass food storage containers go, these Pyrex glass bowls were a nice starting place for me. I still use them ALL the time. I especially like their large size, and the fact that they’re made of very thick glass. And, well, they’re Pyrex! But the lids definitely aren’t air-tight (despite that nifty little feature on top). After using those for awhile (to store fresh-cooked leftovers in), I thought I was content. Then I discovered Lock & Lock plastic food storage containers, and I bought one in every size and shape! I love the air-tightness that you get with those lids. There are 4 strong clamps — one on each side of the lid — and a silicone ring inside the lid which tightly hugs the rim of the container. Together, those features securely keep the air out 100% of the time. I quickly turned my mother-in-law and other friends on to them. And I’m happy to report that they like them as much as I do. However, since they’re plastic, I don’t keep many fresh-cooked foods in them — because plastic is porous, and it tends to stain from greasy and/or colorful foods. So I still use the glass Pyrex bowls for leftovers. Plus, over time, the plastic Lock & Lock containers begin to look scratched and dirty — even when they’re perfectly clean. It’s nothing new. All plasticware does this — especially if you use it a lot. So when I heard about glass Lock & Lock bowls with the same stay-tight lids (although the lids are still plastic), I wanted some so badly. They’re hard to find and kind of expensive, so I’ve kept my eye out for sales but I haven’t bought any glass Lock & Lock containers yet. Recently, while shopping at Costco, I saw this set of Snapware Glasslock food storage containers that have the same stay-tight lids as the Lock & Lock (with the silicone ring to keep the contents fresher longer). Initially, I didn’t buy them — because I’ve closely examined the plastic Snapware food storage containers before, and they’ve always seemed a little “cheaper” quality than the plastic Lock & Lock containers that I own. So I wasn’t willing to risk it just yet. The next time I was in Costco, however, I bought that set of Snapware glass food storage containers. And I absolutely love them! I like them so much, I’m thinking of buying a second set — even though I really don’t need that many bowls in my kitchen. However, they are nestable. So that helps to minimize the amount of space they take up inside the cabinets. By the way, this particular set of glass Snapware with locking lids is oven safe, whereas earlier versions were not. To be honest, I’ve never thought about the color of the lids making a difference. But my Snapware glass containers came with light green lids (similar to a mint green), and every time I open the refrigerator now I smile inside when I see them. The green subliminally makes you think of “fresh” and “healthy”. So the inside of my refrigerator always looks neat, organized, and healthy now when I open it! 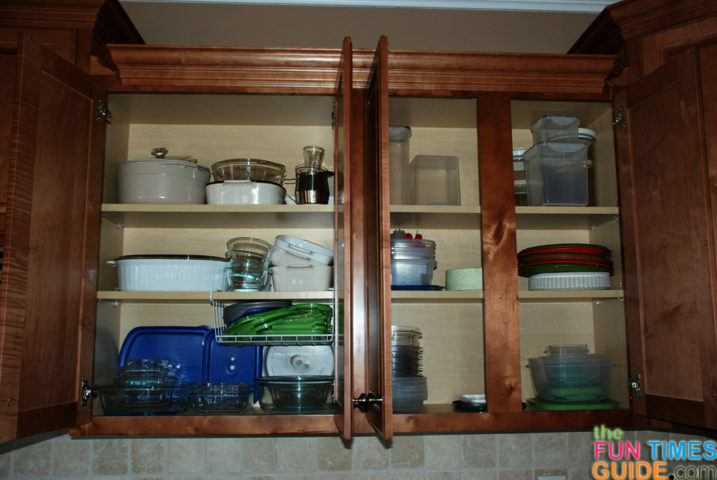 Try to stick to all one shape of containers — either mostly squareish or mostly roundish. They don’t have to all be identical in shape, just similar, so they’ll all stack nicely together, nested one inside the other. For me, it’s more about the technology than the brand, as far as food storage containers are concerned. While I like Snapware glass food storage containers a lot, and I would probably like Lock & Lock glass bowls a lot, I’m not really married to one brand. I care much more about the features and the overall quality. Besides, lots of other reputable companies that make food storage containers are likely to come out with similar and/or better glass bowls in the future. For example, Rubbermaid glass food storage containers look very nice, but I’m just not sure I like their lids right now. They must be glass — I have enough Lock & Lock plastic containers that still look nice and will grow old with me. Anything new that I purchase will be glass from here on. They must be see-through — So I can see, at a glance, what’s inside at all times. (Out of sight, out of mind in my pantry and in my refrigerator!) Therefore, clear glass, as opposed to colored glass. They must be safe and multi-purpose — BPA-free, shatterproof, and usable in a variety of settings: freezer safe, microwave safe, dishwasher safe, and oven safe. They must be nestable — Usually, this means that the bottoms are slightly graduated so that one bowl will fit inside another bowl from the same set. However, most of your square bowls should fit within your other square bowls. Likewise, most of your round bowls should fit within your other round bowls. Ideally, they will have the 4-sided lid locks — To date, I’ve found this to be the best type of lid to keep food fresh, since all 4 sides of the bowl are firmly clamped down at all times. The good part: even round bowls can have this type of lid. Ideally, they will have the silicone ring inside the lid — This, along with the 4 strong clamps on each side of the lid, is what makes the bowls truly air-tight. Ideally, they will have green lids — When given the choice, I will always choose light green when I buy items for my kitchen from now on. For what it’s worth, I never put the plastic lids that come with glass containers in the microwave (even if it clearly states that they’re microwave safe). For example, Lock & Lock says that the lids are safe to use in the microwave as long as you place the lid upside down on the bowl (so the silicone ring is facing the top of the microwave). But I don’t want to take the chance of shrinking any of my plastic lids or harming the silicone in any way — over time. I also don’t put any of my plastic containers or lids in the dishwasher. I don’t want the extreme heat from the dishwasher warping the lids, harming the silicone rings, or shortening their life in any way. By not putting plastic bowls and lids in the microwave or dishwasher, I’m also eliminating any possibility that BPA could potentially leach from the plastics when heated (even though most of my bowls — like the Snapware Glasslock and the Lock & Lock plastic containers — are BPA-free).